Innovation practitioners know that they should not listen to the experts who approach life with rigid blinkers that prevent them from visualising anything outside their conditioned minds. TAKING a leaf out of what our Prime Minister wrote in this space two weeks ago, innovative thinking is undoubtedly a significant driver in propelling the nation’s economy to new heights. It is imperative that Malaysians embrace a culture of innovation. But let’s take a step or two back, before we can begin to move forward. 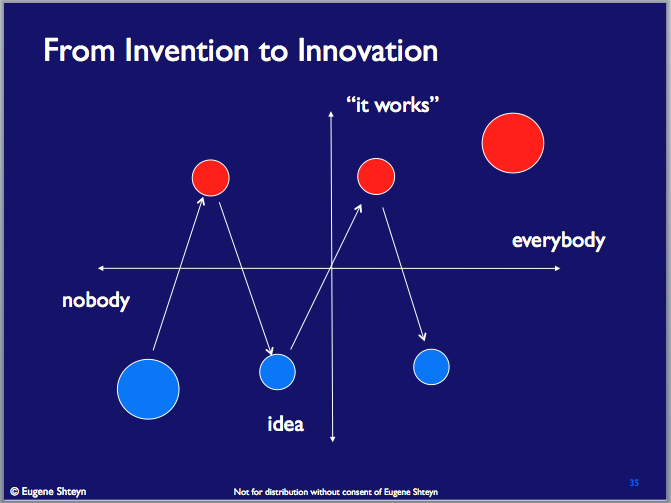 It is important to pin down exactly what innovation means. Several readers have asked me if innovation is the same as invention, especially after reading about Malaysian researchers winning awards for their inventions. In fact, although they may appear similar at first glance, upon closer inspection both are very different indeed. If you make something unique or original, that’s an invention. Whether the invention has value or not is immaterial. This is why we see whacky inventions like toothbrushes for dogs or a clip-on fan on chopsticks to cool down noodles. Both these examples are unique and original but offer little value to most citizens. Innovation demands creating additional value, even though a product or service may not be unique or original. The innovator must first unravel customer needs, and then figure out how to inject greater value at different parts of the solution. Let’s look at two examples. Forty-five years ago, the radical economist and philosopher E.F. Schumacher formed an NGO called Practical Action to help people in developing countries help themselves. Practical Action states that more than 1.6 million people in developing countries die of diseases and accidents caused by cooking and heating fires in homes. This is not surprising, given that one third of humanity still uses rudimentary stoves fuelled by wood, charcoal or dung. Liquefied petroleum gas (LPG) is a viable solution as it costs less than wood or charcoal, but most villagers cannot afford the stoves. Some African countries have implemented an innovative “revolving fund” credit system that allows villagers to buy stoves. It works exactly like the “kutu” scheme prevalent in Malaysia for decades, although illegally. Ten households get together and form a fund, with each household contributing a fixed amount to the fund each month, for 10 months. Every month, one household collects the contributions that month to buy a stove. The following month, another household gets the total contributions to buy their stove. Households draw lots to see who will get the fund over the next 10 months. Within 10 months, all 10 households get their LPG stove. Now imagine adapting this idea to meet the needs of entire communities and you see the power of this innovative funding system. No handouts or subsidies from the government and no bank loans either – the villagers help themselves, through innovation. This is a common sense solution, not rocket science. To be precise, this is innovation. Let’s look at the second example. Does the number of new books that hit the bookshelves every month overwhelm you? It was predicted that the Internet would spell the death of the printed word, but in fact the reverse has happened. There are now more books in print than at any other time in history. How does one keep up? As it is commonly known, a number of innovative online companies have found a practical solution to this. For a small fee, these companies provide a short summary of a book containing all the essential ideas presented in the book. Most people can read these summaries in 15 minutes, making it possible to read at least one book each day. This “compressed knowledge” is another example of innovation. Ultimately, innovation is not confined to technologies, products or services. You can have innovation at every stage of the business cycle – from manufacturing to distribution to sales to post-sales support. Just look at Nike, the world’s largest supplier of athletic shoes and apparel. It does not own a single manufacturing factory, but focuses on innovation in design and marketing. Another well-known example is DHL, a world-leading courier and logistics company that relies on innovation to accurately ship a document or parcel from the point of origin to its destination. For you to benefit and profit from innovation, you have to dissect your business or activity into its key pieces or “parts”. The “eco-system” must be correctly identified, as dealing with just one part of the problem or value-chain is unlikely to bring satisfactory results. Nothing exists in isolation and even seemingly unconnected things are actually connected, so a “village” or holistic approach to innovation is necessary. For each piece or part, you have to ask a fundamental question: How can I do this better, so that the outcome is greater than it is now – at a lower cost? Your brain will rebel at first and tell you that it cannot be done. Don’t listen to your brain; it is a lazy device looking for the easiest way out. Innovation practitioners know that the last person you should listen to is your own self. Don’t listen to the experts either, for they approach life with rigid blinkers that prevent them from visualising anything outside their conditioned minds. Adopt a child-like disposition and question the assumptions that you and others have taken for granted. Persist until you have questioned each and every aspect of all the pieces of the puzzle and found answers that are uncommon. This sounds easy, but it is the most difficult step as it questions all the sacred cows lurking in your belief system. Done correctly, however, it can lead to breakthrough innovations. If you have been through this process, share your stories with me at kamal@pmo.gov.my so that other readers can benefit from your lessons too. > Unit Inovasi Khas CEO Datuk Seri Dr Kamal Jit Singh is hoping to jolt Malaysians out of complacency. Two and a half years ago, I co-founded Stroome, a collaborative online video editing and publishing platform and 2010 Knight News Challenge winner. From its inception, the site received a tremendous amount of attention. The New School, USC Annenberg, the Online News Association and, ultimately, the Knight Foundation all saw something interesting in what we were doing. We won awards; we were invited to present at conferences; we were written about in the trades and featured in over 150 blogs. Yet despite all the accolades, not once did the word “invention” creep in. “Innovation,” it turns out, was the word on everyone’s lips. Like so many up-and-coming entrepreneurs, I was under the impression that invention and innovation were one and the same. They aren’t. And, as I have discovered, the distinction is an important one. In its purest sense, “invention” can be defined as the creation of a product or introduction of a process for the first time. “Innovation,” on the other hand, occurs if someone improves on or makes a significant contribution to an existing product, process or service. Consider the microprocessor. Someone invented the microprocessor. But by itself, the microprocessor was nothing more than another piece on the circuit board. It’s what was done with that piece — the hundreds of thousands of products, processes and services that evolved from the invention of the microprocessor — that required innovation. If ever there were a poster child for innovation it would be former Apple CEO Steve Jobs. And when people talk about innovation, Jobs’ iPod is cited as an example of innovation at its best. So, given those sobering facts, is the iPod’s distinction as a defining example of innovation warranted? Absolutely. What made the iPod and the music ecosystem it engendered innovative wasn’t that it was the first portable music device. It wasn’t that it was the first MP3 player. And it wasn’t that it was the first company to make thousands of songs immediately available to millions of users. What made Apple innovative was that it combined all of these elements — design, ergonomics and ease of use — in a single device, and then tied it directly into a platform that effortlessly kept that device updated with music. Apple invented nothing. Its innovation was creating an easy-to-use ecosystem that unified music discovery, delivery and device. And, in the process, they revolutionized the music industry. Admittedly, when it comes to corporate culture, Apple and IBM are worlds apart. But Apple and IBM aren’t really as different as innovation’s poster boy would have had us believe. Truth is if it hadn’t been for one of IBM’s greatest innovations — the personal computer — there would have been no Apple. Jobs owes a lot to the introduction of the PC. And IBM was the company behind it. Ironically, the IBM PC didn’t contain any new inventions per se (see iPod example above). Under pressure to complete the project in less than 18 months, the team actually was under explicit instructions not to invent anything new. The goal of the first PC, code-named “Project Chess,” was to take off-the-shelf components and bring them together in a way that was user friendly, inexpensive, and powerful. And while the world’s first PC was an innovative product in the aggregate, the device they created — a portable device that put powerful computing in the hands of the people — was no less impactful than Henry Ford’s Model T, which reinvented the automobile industry by putting affordable transportation in the hands of the masses. Given the choice to invent or innovate, most entrepreneurs would take the latter. Let’s face it, innovation is just sexier. Perhaps there are a few engineers at M.I.T. who can name the members of “Project Chess.” Virtually everyone on the planet knows who Steve Jobs is. But innovation alone isn’t enough. Too often, companies focus on a technology instead of the customer’s problem. But in order to truly turn a great idea into a world-changing innovation, other factors must be taken into account. According to Venkatakrishnan Balasubramanian, a research analyst with Infosys Labs, the key to ensuring that innovation is successful is aligning your idea with the strategic objectives and business models of your organization. 5. Business value: Assessing the value (monetary, market size, etc.) of the innovation and how the idea will bring that value into the organization is a critical underlying factor in selecting which idea to pursue. Said another way, smart innovators frame their ideas to stress the ways in which a new concept is compatible with the existing market landscape, and their company’s place in that marketplace. This adherence to the “status quo” may sound completely antithetical to the concept of innovation. But an idea that requires too much change in an organization, or too much disruption to the marketplace, may never see the light of day. While they tend to be lumped together, “invention” and “innovation” are not the same thing. There are distinctions between them, and those distinctions are important. If invention is a pebble tossed in the pond, innovation is the rippling effect that pebble causes. Someone has to toss the pebble. That’s the inventor. Someone has to recognize the ripple will eventually become a wave. That’s the entrepreneur. Entrepreneurs don’t stop at the water’s edge. They watch the ripples and spot the next big wave before it happens. And it’s the act of anticipating and riding that “next big wave” that drives the innovative nature in every entrepreneur. By Tom Grasty This article is the seventh of 10 video segments in which digital entrepreneur Tom Grasty talks about his experience building an Internet startup, and is part of a larger initiative sponsored by docstoc.videos, which features advice from small business owners who offer their views on how to launch a new business or grow your existing one altogether. Who invented bank deposit insurance? The West learned and copied most of the present technologies based on inventions from China, like papers, printing press, compass, ship building, rocketry, gunpowder, etc. China’s 5,000 years testified these. It was China’s educator, Confucian, not the Bible initiated learning culture there. The West shamelessly claimed the modern technologies as theirs. No wonder they are on declining now as a result of their arrogance and ignorance! Technology is developed, obsolete fast if not continuously improved, innovated and developed. In facts, all technologies are copied from one to another: from the East to the West, from the West to the East. It is dangerous if you do not know how technology works when you buy it, like flying a aircraft without proper know-how to use it. Know-how or technology is invisible competency within the root, i.e. fundamental self you can’t see. You only see the tree, but not the root! The technology we see in everyday life is only a form not substance! To succeed, let us constantly learn creating new ways, not just following the Bible.